Camel City BBQ | Whats Happening? 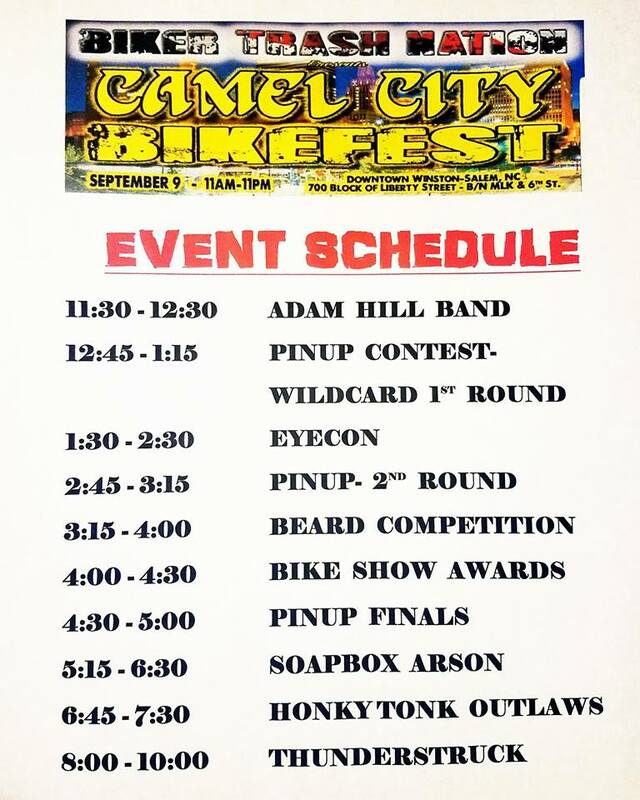 2nd Annual Camel City BikeFest Update! Where you going to be at? Here’s Where we will be. 700 North Liberty Street, Winston-Salem, NC If you want to ride in with a big group to Camel City Bikefest, the Forgotten Sons MC are doing a ride in again this year with the proceeds going to Purple Heart Homes! I have to tell you it gave me chills last year to hear all those bikes rolling in at one time rattling the windows of all those buildings downtown. Let’s make it even bigger and better this year!! The deadline was September 1st-Applications Closed! Camel City Bikefest presented by Smokin Harley Davidson is right around the corner on Saturday, Sept.9th! So much going on this year that you are not going to want to miss!! Radical Randy is back with his Battle of the Baggers bike and sound show, the Ted’s Kickin Chicken stage has bands rocking all day, and Irvin Roberts Salon and Ardmore Barber Shop are bringing you the Miss Camel City Bikefest Pinup Contest and a Beard Competition for the fellas, and this year we have our friends from Tattoo Therapy setting up to do tattoos in the Liberty Room at Camel City BBQ Factory. Let’s not forget our vendors, food trucks, and some of your favorite watering holes that will be set up with adult beverages. Bikes, Babes, Beards, Bands, and Beer…what more could you want?? Click here to like the pic attached to THIS POST!! That is the only way your vote will count. If you share to help your favorite lady out, you must share the original post with all the pics of our winners! Click here to download Event Schedule. Make sure to go by the Double D Burnout Saloon spot at Camel City Bikefest to get an adult beverage and the Special Edition Biker Trash Nation shirt! Huge thanks to Double D for sponsoring this shirt so that all proceeds can go directly to Purple Heart Homes to help out disabled veterans!!! Ladies and Gentlemen , boys & girls, children of ALL ages…presenting the 1st Ever Camel City Bikefest sponsored by Smokin Harley Davidson & in association with Budweiser, Camel City BBQ, & Biker Trash Nation. Save the date & mark this one on your calendar because it’s going to be a blast! This event will be held in downtown Winston-Salem on Liberty Street between 7th and MLK Drive. Come on out for Bikes, Bands, Beer, vendors and more! Hed Trip, Confuzion, White Knuckle Blackout, The Terrible Two’s, Absent Theory, Joey Nevada and more to be announced soon. Stay tuned for updates at Ray Publishing on the Camel City’s first Bikefest! Sign-up on Facebook – Visit us on Facebook and Sign-up here!